In this time of housing crisis, I can now assure you that our lovely ladies suffer no such fate. After extensive (and exhaustive!) research, we chose JK Chicken Coops to construct the girls’ permanent home — and what a home it is!! This amazing coop has two big roosts, four nesting boxes with exterior access, electricity — including a light fixture, switch, and two outlets — a fantastic run, and exceptional craftsmanship. And, what’s more, all of this was far more affordable than if we had just purchased a decent kit or built it ourselves. They made all the modification we requested to fit the coop’s location in the yard and even the little details that people with too much time invested in thinking about the whole enterprise can come up with. 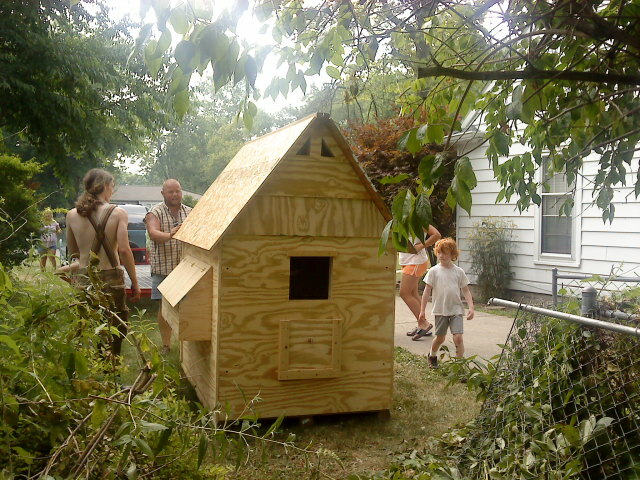 The coop arrived already built and ready for its eager inhabitants. It’s a truly substantial structure, which meant that moving it required many hands and lots of strength! 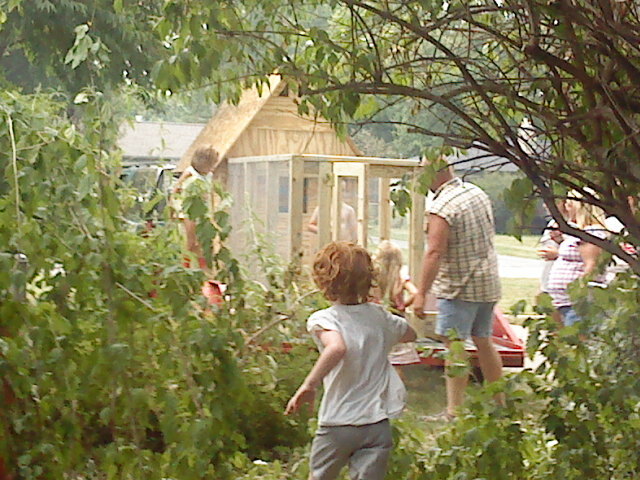 We took down a piece of fence, and everyone worked together to pull it into the backyard. The run can be removed from the coop; it’s held on by four big bolts. 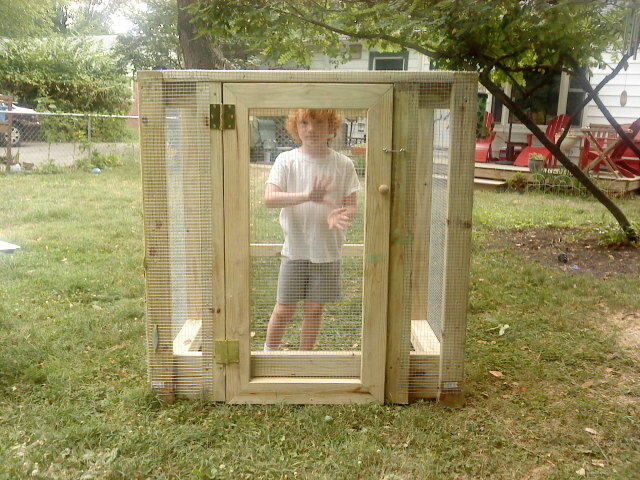 It has windows, great ventilation, a nice human access door, and the requisite chicken ramp. The chicken door is operated by a pulley system, so it’s easy to let the girls in and put them up at night without entering the run. It took them a day to get adjusted, but now they love it! Our adorable little hen house! As soon as this insane weather breaks, we’re going to paint the coop white with green trim and add the same shingles as our house and garage have. The girls’ house will be a mini version of our own! We’ve already started free-ranging the girls in the evening, and they’re doing very well. They love wandering around the yard, but stay pretty close to home. When it’s time to turn in, I toss a handful of cracked corn in the run, they head in for their bedtime snack, then go inside their house for a good night’s sleep. 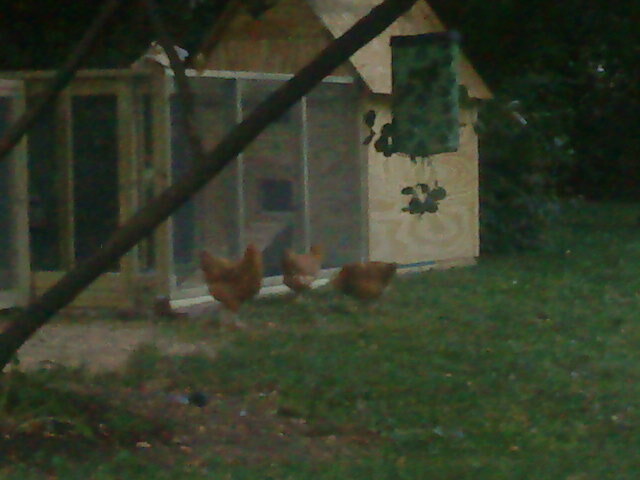 We are so delighted with the coop, and anticipate a good, long time of happy chicken living!